ALVA, Okla. – Even before he made his decision on what university to attend, Devin Olson knew he wanted to be a steer wrestler. He was watching The American semifinals in Fort Worth, Texas, a year and a half ago and met Northwestern Oklahoma State University rodeo coach Stockton Graves. That meeting led the Taylors Falls, Minn., cowboy to choose Northwestern and make the move 800 miles from home to Alva. He made the right decision and was one of several cowboys behind the Northwestern men’s team title this past weekend at the Southeastern Oklahoma State University rodeo in Durant, Okla. Olson joined fellow bulldoggers Jace Rutledge, Bo Yaussi and Bridger Anderson in the championship round of that event alone. In all, Northwestern held 11 spots in the short round in the men’s race and another five spots in the women’s division. He may be right. Anderson won the bulldogging in Durant; he finished in a three-way tie for second in the opening round, then won the short-go with a 4.2-second run, which was more than half a second ahead of the runners-up. His two-run cumulative time of 8.9 seconds scored the Carrington, N.D., sophomore his first victory of the new season. Rutledge placed in both rounds and finished third overall, while Yaussi finished in a tie for second in the final round to move up to fifth in the average. Olson was one of three men who had a 4.7-second run to finish in a tie for second place in the long round. Yaussi, a recent transfer to Northwestern, also scored points in tie-down roping. He won the first round with an 8.6-second run but failed to secure a time in the championship round. 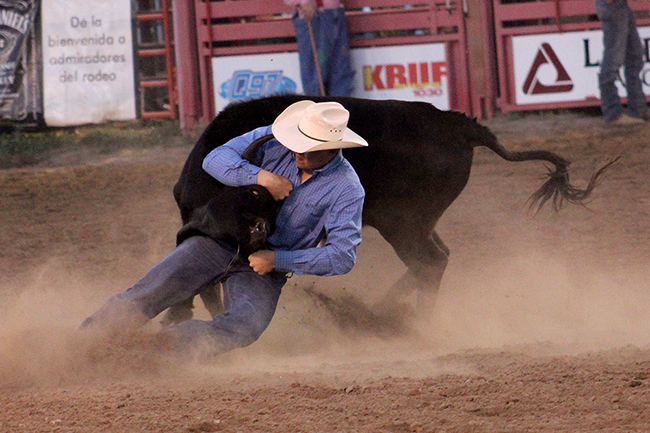 Riley Wakefield placed high in both rounds to win the tie-down roping title. Wakefield also added 25 points in team roping, heeling for Southeastern’s Denton Halford. The two finished in a tie for fourth place in the first round but suffered a no-time in the short round. Heeler Jeremy Carney was the biggest points earner in team roping for the Rangers, winning the first round with his partner, Laramie Warren of Southeastern. They finished third in the short round and third overall. The Northwestern tandem of Kass Bittle and Cole Koppitz finished in a tie for second in the short round and placed third overall. Header Tyler Munsell and her partner, Garden City Community College’s Ean Price, were third in the opening round and finished sixth overall. Heeler Tanner Nall, roping with Ethan Griffin of Northeastern Oklahoma A&M, placed in a tie for sixth place in the first round. Makayla Mack led the women’s team by finishing third in both the short round and average inn breakaway roping. Melissa Couture clocked in at 2.6 seconds to finish in a tie in the opening round. Natalie Berryhill finished second in the first round of barrel racing with a 16.68-second run, while Trinity St. Andrews finished sixth in the short round and average. Goat-tier Megan Turek had a 9.2-second run in the first round to finish in a three-way tie for third, but she was saddled with a no-time in the short round. Like the other Rangers, Olson has two rodeos under his belt to kick off the new season. He knows he has the support of his teammates and Graves to push him on to the next eight events, two more coming in the fall semester. He’s also got the help from another teammate, his horse, Jimmy. “My goal at the beginning of the year was to make myself a better steer wrestler, be more competitive and be more consistent in all my runs,” he said. “I want to put in good competitions and make the NFR.